The best way to experience the vibrant Mills community is to live on campus. Because our students represent a wide range of ethnicities, backgrounds, ages, and interests, living together and drawing from that breadth of experience becomes part of the learning process. Of course, it’s also a great way to make lifelong friends. Approximately 80 percent of first-year students live on campus and find a home-away-from-home in Warren Olney or Orchard Meadow Residence Halls. 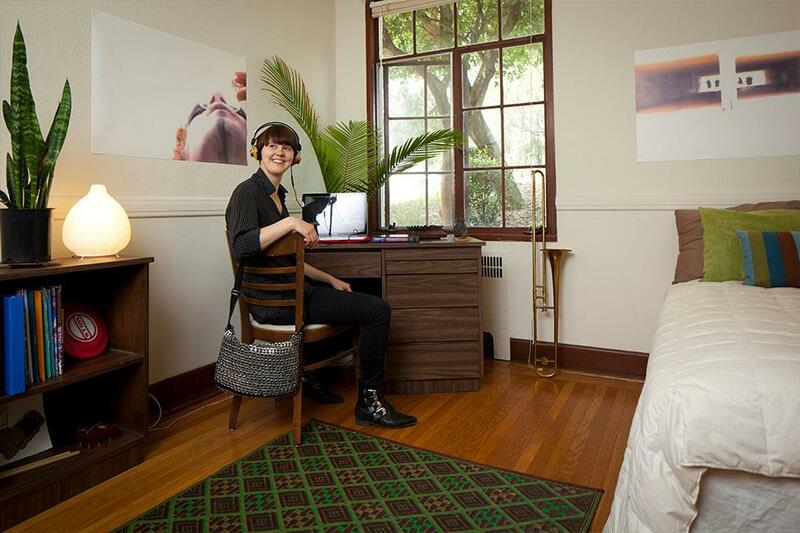 First-year students live in themed housing communities that focus on a shared interest like graphic novels and fandom, Bay Area exploration, and social justice. 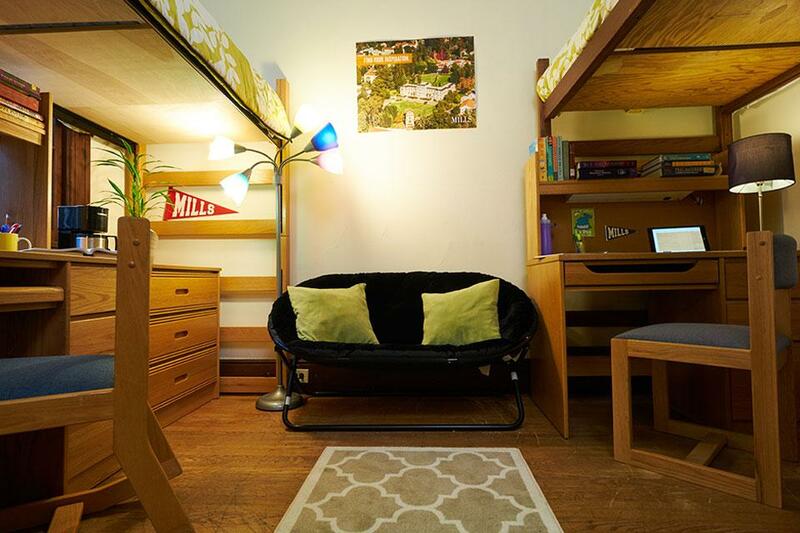 Mills students have a choice between single and double rooms—either option will come equipped with a twin bed, desk, dresser, and bookcase, and most include an in-room sink, so all essentials are covered. Ethel Moore Hall houses juniors, seniors, and graduate women. 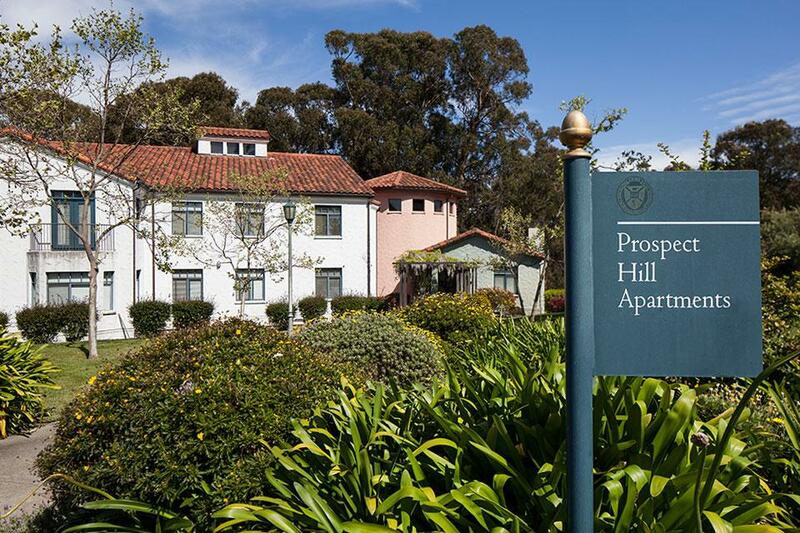 Located atop Prospect Hill, this picturesque residence hall boasts expansive views of the East Bay, two beautiful courtyards, and a pedestrian path that connects to the center of campus. One of the best parts of living at Mills is the great weather and the opportunity to get a room with a shared California sleeping porch! This covered, outdoor porch is an option in our two first-year student residence halls. It makes for a great place to study, hang out, or just enjoy our campus views and sunshine. 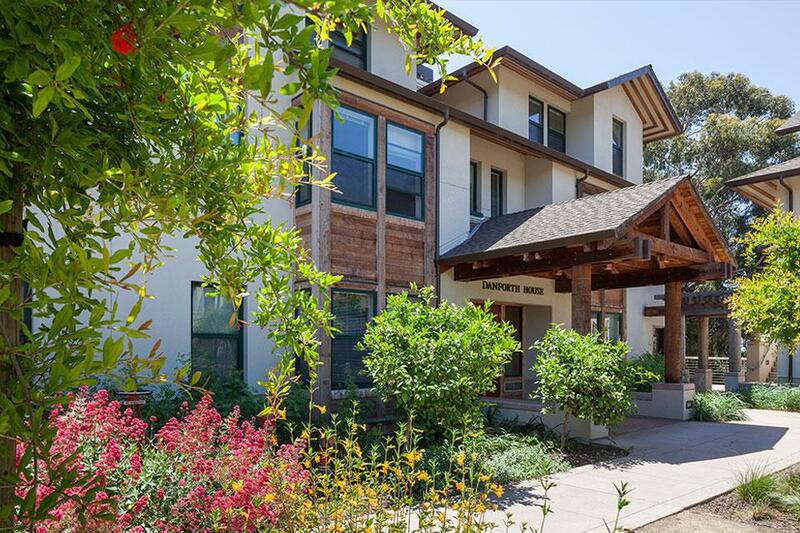 The Courtyard Townhouses offer distinctive Craftsman-style apartments for undergraduate and graduate students 21 years of age or older. Students have a choice of four- or five-bedroom apartments that include a kitchen and adjoining dining room, two bathrooms, a living room with cable TV hook-up, and high-speed Wi-Fi. 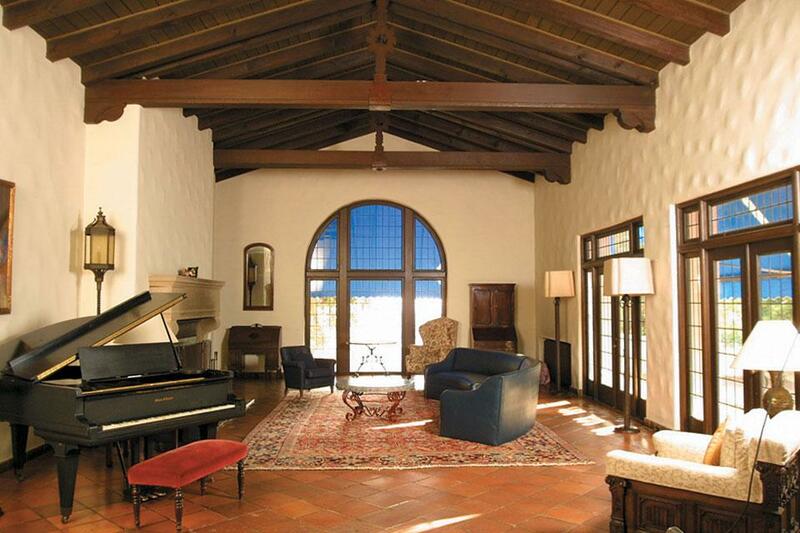 With its charming Mediterranean-style architecture, community sunroom, and large stone fireplace, Mary Morse Hall provides students with a beautiful communal gathering space as well as the option to live in a single or double room. Providing new and modern spaces for Mills students interested in more independent living, Prospect Hill Apartments are situated atop one of the highest points of campus. Each furnished four-bedroom apartment includes a kitchen, living room, and disability access. 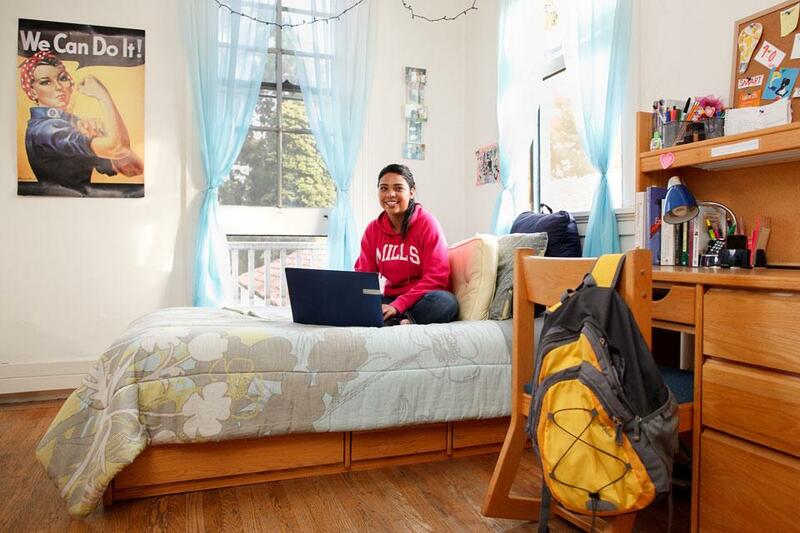 We offer a range of housing options for both undergraduate and graduate students (families, too) depending on your class year and age, and we can accommodate students with disabilities, allergies, service or emotional support animals, and other special needs. We also offer 12-hour quiet housing and a gender-fluid living community. Our residence halls and apartments have everything you need to make campus living a home away from home, including free Wi-Fi, laundry, kitchens, and 24-hour secure entrances. We have a dedicated team of professional and student staff to make your residential living experience as educational as your academic experience (and fun too!). If you need help settling in or have questions about campus life, our student resident assistants (RAs) and professional area coordinators will help you find the answers. Learn more about residential life. First-year, traditional-age undergraduate students have the added benefit of living in one of our themed housing communities where students come together around a shared interest, such as graphic novels, outdoor adventures, social justice, or wellness. Based in our two first-year residence halls, Warren Olney and Orchard Meadow, these communities bring students together to explore campus, the Bay Area, and beyond. Learn how to apply for first-year housing (PDF). Undergraduates past their first year, graduate students, and students 21 or older may choose to live in residence halls, campus apartments, or shared cooperative housing. New transfer and new graduate students can complete the housing application online, including special requests and a roommate matching service. Read about applying as a new transfer or new graduate student (PDF).